Michael Heffernan’s tenure as state revenue chief proved to be a job bonanza for a half-dozen of his associates, including Wellesley residents, former co-workers, and Wellesley Country Club golfers. A review of resumes and other documents obtained by the Globe reveals that Heffernan, whom Governor Charlie Baker made commissioner of the Department of Revenue in May 2016, provided these friends and colleagues with high-paying jobs within the agency during his 15 months in the post. Aides to Baker would not address questions about Heffernan’s personal relationships with these hires but said in a statement that they are all qualified for their jobs, some of which were created at a time Baker had imposed a hiring freeze. Neither the employees in question nor Heffernan, whom Baker made his top budget chief in August 2017, responded to Globe requests for comment. A spokeswoman, Lizzy Guyton, cited Kristin Lindquist’s professional experience as a securities trader and portfolio manager. But the hires appear to be at odds with Baker’s own pledge during his 2014 gubernatorial campaign to give Beacon Hill “a strong medicine” to cure it of its insider employment practices and “root out patronage.” In fact, Heffernan was on the same ticket with Baker, running as the GOP candidate for state treasurer that year. The Globe reported earlier this month that Kristen Lindquist, 53, a social friend and neighbor of Heffernan’s, was hired in 2016 for a $121,000-per-year job as the DOR’s associate deputy commissioner for administration and chief risk officer. In a written justification for the creation of Lindquist’s position, the department said a new official was needed to deal directly with managing risk, such as data security breaches, and protect the agency from threats to its digital security. It cited the rollout of two major technological systems, both of which have run into serious snags. Lindquist’s resume showed no background in that sort of digital risk management. Before Lindquist was hired, Heffernan had tapped Christopher Harding as his chief of staff in June 2016. Harding was working at Mobiquity Inc., a Wellesley-based firm that Heffernan cofounded. He was the company’s executive vice president of sales, marketing, and business development. Heffernan expanded the duties of chief of staff and paid Harding $140,000 per year, $33,000 more than the starting salary of the previous chief of staff. Like Lindquist and her husband, Harding, 53, and his wife — who live just over a mile away from Heffernan in Wellesley — supported Heffernan’s unsuccessful race for treasurer in 2014, donating $1,000. 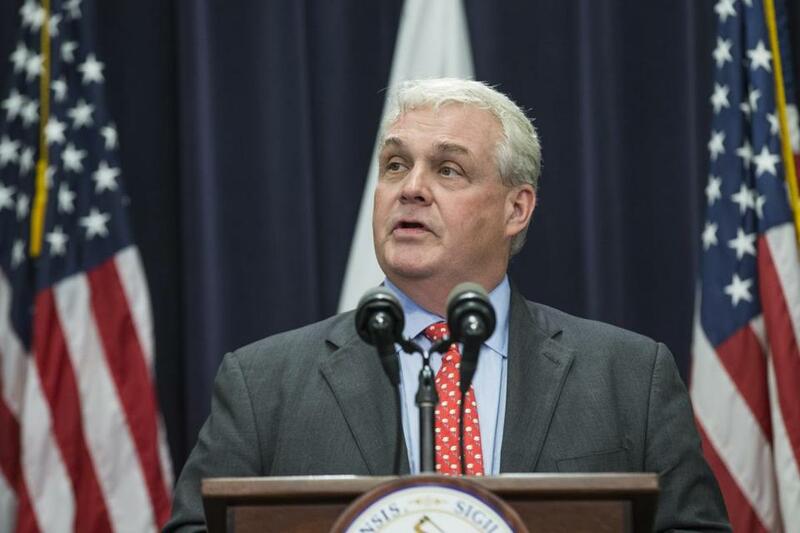 When Baker elevated Heffernan last August to the Cabinet-level post of secretary of administration and finance (which oversees DOR), Heffernan chose Harding to take his place as state tax commissioner with a $158,000 annual salary. Harding then turned to another fellow Wellesley resident, 59-year-old Philippe M. Mauldin, to serve as his chief of staff at a salary of $140,000 per year. Mauldin lives two homes away from Heffernan on Grove Street. Having left a job at Fidelity in 2017, he listed himself as “retired” on his LinkedIn business profile. He had spent 20 years at Fidelity Investments and 11 years at JP Morgan Chase. Heffernan also pulled in another Wellesley resident, William McNamara, who — like Heffernan — plays golf at the Wellesley Country Club and lives just over 4 miles from Heffernan. His resume shows he has long experience at major financial firms, including 16 years at Fidelity Investments (overlapping with Mauldin) and its brokerage division. Shortly after Baker chose Heffernan to be his tax commissioner, the 55-year-old McNamara was put on the Revenue Department’s payroll as deputy commissioner for legislative affairs and policy director at a salary of $141,000 per year. That is not where he is working now, although he is still on the DOR payroll. McNamara moved with Heffernan to the Executive Office of Administration and Finance with the title of assistant secretary — a position Heffernan created for him. He donated $350 to Heffernan’s campaign for treasurer. Suzanne Kisiday, 53, until recently lived a mile from Heffernan’s home in Wellesley. She was a member, along with Heffernan and his wife, of the Wellesley Country Club, according to a membership list, the Globe has learned. She was recently put on the DOR payroll as the agency’s marketing and digital service director, with a $90,000 annual salary. Kisiday’s resume shows that she has worked in marketing for several high-end real estate companies, including Coldwell Banker in Wellesley from March 2016 until she joined the Revenue Department earlier this year. She also worked as a consultant to Babson College and held a number of marketing and media promotion jobs in the 1980s and ’90s. Since 2014, she has been running a blog she created that helps women deal with issues around divorce. Meanwhile, before he was elevated to the Baker administration’s chief budget officer, Heffernan found room for an old colleague and 60-year-old friend, Geoffrey E. Snyder, to join his DOR team. He was hired as deputy commissioner, in part overseeing Lindquist’s work on risk management. After 20 years working as a manager at several New York’s major financial firms, Snyder was living in Chatham, N.J., teaching as an adjunct professor of finance at two New Jersey colleges and in China when Heffernan chose him to be the DOR’s deputy commissioner for $140,000 per year in 2016. The two had worked together at CitiGroup Global Markets, having started at the same time in August 1992. Although a New Jersey resident, he donated $500 to Heffernan’s 2014 campaign for treasurer. Baker, as a gubernatorial candidate, vowed to put an end to cozy state hiring practices. At the time, the scandal of patronage hiring in the Probation Department was in the headlines, and Baker talked about what he was hearing on the campaign trail when he announced a program to crack down on such job handouts and make the hiring process for state government more transparent.